What a delicious way to start the month, I thought. Scandal. Steamy affairs, illicit liasons in five-star hotels where there’s more than just a chocolate on your pillow, naughty goings on between “nice” people. Then I thought – no. Not that sort of scandal. How about this sort of scandal? When the government lies to its citizens about their privacy, when phone calls, tweets, blog posts – yes even blog posts – almost any and every utterance is recorded, monitored, filed and catalogued. Isn’t that a scandal? Or is it the potential early release of a man who betrayed this country, selling our secrets to an ally, who in turn first used the illgotten intelligence to carry out its own missions and strikes, and then passed that intelligence onto the then Soviet Union. That to me is a scandal. But then so is the hushing up of medical problems for many of our soldiers who served in Operations Desert Storm and Desert Shield and whose exposure to chemical agents has rendered many of their children deformed, and/or with disfiguring birth defects. That’s also a scandal. I wish the word was used more selectively. Birth defects and deformities due to the wilful and wanton exposure of our troops to harmful chemicals – is a scandal (see definition 1) – Britney Spears’ underwear malfunction is not. The indiscrimminate monitoring of our enail, phone calls, conversations and communications by government agencies both at home and overseas – without our agreement and without our knowledge – THAT is a scandal. When Lindsey Lohan’s credit cards are declined in New York, it’s not. So having ascertained what is/is not a scandal – or even scandalous – let’s take a look at some real honest to goodness scandals – revisit some oldies but goodies, and maybe take a peek at some you may not have heard of yet. April is the cruelest month, wrote T.S. Eliot in The Waste Land, and looking at scandal may be one reason why that’s still true. 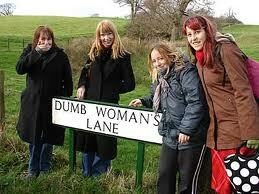 Dumbwomanslane? What kind of name is that? On the way into the picturesque towns of Rye and Winchelsea on England’s south coast, there’s a twisting, turning, hair-pin-bend ridden, narrow country road called Dumb Woman’s Lane. It’s a favorite site for tourists and travellers in the area who enjoy taking pictures of themselves with the sign! . Why, in an area known for some of England’s most fabulous women – writers such as Virginia Woolf, Catherine Cookson, Angela Carter even Beatrix Potter spent time here, artists and actors – Dame Ellen Terry, Dame Anna Massey – the list is extraordinary – is there a road with such a demeaning, insulting name? It’s part of our knee-jerk culture to immediately suppose that the Dumb Woman of the eponymous lane was stupid, ignorant or a fool. 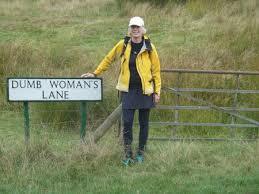 So why choose Dumb Womans Lane as the name for my blog? I am surely a woman, and I am not, nor have I ever been, dumb – in any sense of the word. Yet sadly in many countries women are still considered “dumb” or “chattels” or even worse, domestic slaves, and so for them – and for all women who have no voice – here’s a place where I can spout. I can say the unsayable, write the unrepeatable and generally ROAR as I said in my opening post. Like Peter Finch said in the movie “Network” so many years back – “I’m mad as hell and I’m not going to take it any more!” So watch out politicians, injustices, anyone whom I think deserves calling out for any reason – dumbwomanslane will not go quietly into this good night. This woman is not dumb. No way! Israel’s Ariel Sharon is dying – and I feel an extraordinary pressure to try and find something positive to say. But I can’t. The man who countenanced and permitted the massacres in the Sabra and Shatila refugee camps in Beirut in 1982 which resulted in the deaths of hundreds if not thousands of Palestinians – is preparing to meet his maker, and I’m wondering what that encounter might look like. The eulogies of course, are bound to be full of plaudits and revisionist history. His courage, his ability to seize victory from the jaws of defeat, his tenacity and his obstinacy. Ever a man of strong convictions and contradictions, Ariel Sharon was loved by the Israeli right wing and loathed by Palestinians and most Arabs. His flamboyant displays of bravado, including the notorious visit to the Temple Mount in Jerusalem in September 2000 which arguably provoked the Second Intifada, resulting in the deaths of yet more Palestinians (over 2,000) and Israelis (over 1,000), were his signature. There comes a time in every woman’s life when the pressure to stand up and speak her mind appears, first like a wraith swirling in from the mists, and then like Stonehenge – strong, indubitable, eternal. Setting up the platform, finding the location, and then screwing up the courage to say – Hey World this is ME! I have something to say. And I’d appreciate a few moments of your time to hear me out. That’s my challenge – and it’s one I accept, as of now. So bear with me as the pages are made up and the ploughshares and pruning hooks all get beaten into shape. Craven, heinous the Charlie Hebdo attack.